Videos seem to do motorcycle riding much more justice than still images especially when footage is taken with a helmet cam. And no doubt, when shopping for motorcycle parts, most of us would appreciate a good product install video over any set of instructions. 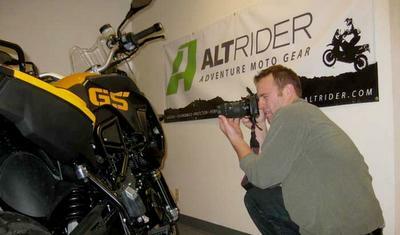 As we are preparing to launch the new AltRider web store in 2010, we definitely plan on including video content that will make shopping and meeting up with other riders easier and more interesting. Over the last few months, we’ve gathered plenty of raw footage, but don’t quite have all the skills to make videos and make them look awesome. Hence, we are bringing on a Video Production intern, Kevin Michael Martin to help us with the task. Hiring an intern is not as simple as one might think (well not when you want 5-star quality). After sorting through over 25 submissions and doing the initial round of phone interviews, we invited 3 candidates for an in-person meeting. All three showed great potential and had solid school and work experience. Part of our evaluation strategy was to give them a take-home assignment, asking to produce a short video from the helmet-cam video content Jeremy gathered on his 6-day ride in the Cascades. We are extremely thankful to Kevin Michael Martin, Luis Alani and Eric Vaughn for taking the time to provide us with their ideas and material. With their permission we have posted the three videos on our YouTube page. Check them out and let us know who you think did a better job.